UCL's four-year Icelandic BA is the only degree programme of its kind outside Iceland. The programme aims to develop your interest in, and knowledge and understanding of Iceland and the Nordic world, in areas including other Scandinavian languages, literature, culture and history. Your third year is spent abroad at the University of Iceland. A score of 16 points in three higher level subjects, preferably including a foreign language, with no score lower than 5. A score of 15 points in three higher level subjects, preferably including a foreign language, with no score lower than 5. Pass in Access to HE Diploma, with a minimum of 28 credits awarded with Merit in the Level 3 units. D3,M1,M1 in three Cambridge Pre-U Principal Subjects. Foreign Language preferred. ABB at Advanced Highers (or AB at Advanced Higher and BBB at Higher). Foreign Language preferred. Successful completion of the WBQ Advanced Skills Challenge Certificate plus 2 GCE A-Levels at grades ABB. Foreign Language preferred. You will spend a year abroad at the University of Iceland in Reykjavik. A broad range of optional modules are available, including Viking Studies, Old Norse, modern Scandinavian languages, literary studies, film studies, history, and cultural studies, together with the opportunity to acquire proficiency in a second Scandinavian language. UCL Scandinavian Studies has specialists across the areas of language, politics, history, medieval studies, literature and film. You will have access to the largest and oldest Scandinavian library in the country, as well as state-of-the-art facilities within the UCL Language Space. In your first year, you will embark on an intensive study of modern Icelandic at beginner's level, study a mainland Scandinavian language (Danish, Norwegian or Swedish) as well as Old Norse, and have the option of studying Scandinavian literary studies and linguistics. In your second year you will continue with language studies and select optional modules. You will spend year three at the University of Iceland, taking a course in Icelandic for foreign students. If you have been given permission to transfer to Icelandic with Danish, Norwegian or Swedish at the end of year one, you will also take a course in your mainland Scandinavian language while at Reykjavik. The final year is spent at UCL, where you will take advanced modules in modern Icelandic and Old Norse, study Icelandic literature, and take further optional modules. If you have transferred to Icelandic with Danish, Norwegian or Swedish you will also take advanced modules in your mainland Scandinavian language. The programme involves modules offered by SELCS, allowing students to study literature, film, art and culture from a wider and more interdisciplinary perspective. You will be exposed to broad cultural movements, issues and approaches and be able to draw on the full range of specialisms within the school. You will also choose interdepartmental modules offered by SELCS. Options may include the study of linguistics, film and history. You will spend your Year Abroad at a university in Iceland, studying alongside native speakers, to make the most of your cultural and linguistic immersion. Students taking Advanced Danish, Norwegian or Swedish may also take 15 credits of advanced-level modules language and will be able to transfer to BA in Icelandic with Danish/Norwegian/Swedish (subject to academic approval). Students taking Icelandic with Danish, Norwegian or Swedish will take 45 credits of optional modules. Teaching consists of a mixture of lectures, classes, seminars, group work and presentations. The language elements comprise four taught hours a week for basic language in year one, four hours a week for intermediate language in year two, and two hours a week for advanced language in the final year. A significant portion of your work will take place in guided independent study. Most modules are assessed by a mixture of coursework and written examination. Some are assessed by essays only. 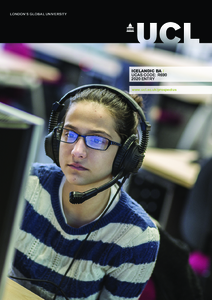 Language modules are assessed by coursework and written and oral examinations. During your year abroad you will take modules at your host university. Detailed course descriptions are available on the department website: Icelandic BA. Upon graduation you will be fluent in Icelandic and also have knowledge of other medieval and modern Scandinavian languages. The historical and literary parts of the degree will develop your cultural awareness. You will be trained in the organisation, presentation and interpretation of complex information, written and oral communication, and independent and group work. Many of our graduates find they are able to use their Nordic languages in a variety of contexts, such as working for Scandinavian companies. Recent graduates have also entered translating, publishing and teaching. Your personal statement should reflect your interests and goals, especially with respect to your proposed degree. Some knowledge or experience of Icelandic culture is expected, as well as an explanation of how this has motivated you to learn more. We do not necessarily require a language at A level or equivalent, but expect you to demonstrate an enthusiasm and aptitude for language learning. If your application demonstrates that your academic ability and motivation make you well suited to our degree and you receive an offer, we shall invite you to a Post Offer Open Day. There, you will be able to experience the sort of teaching we offer and life in SELCS. Our admissions process aims to assess your linguistic abilities and attainments as well as your cultural awareness, motivation for study and intellectual potential. We may interview candidates by telephone in order to establish a level of language ability.